"No one forgets that they were once captive, even if they are now free." There are countless works of fiction that explore America's torrid past with slavery. Last year alone saw several works about the subject. Despite the plethora of study and writings (both fiction and non-fiction), there are inevitably pieces of the history that remain unexplored. To be fair, Americans seem to have a difficult time thinking about the despicable institution that flourished during the founding of our country. Still, no work that I've read thus far has truly captured the scope and lasting effects of slavery. 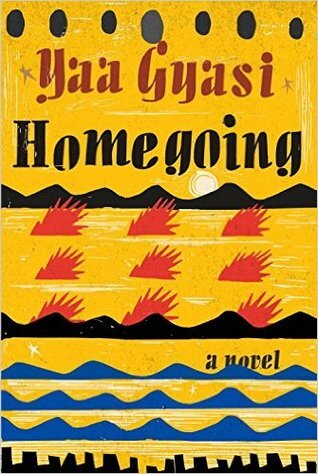 Enter Yaa Gyasi and her remarkable debut novel Homegoing. At just 26, Gyasi has written a novel that eloquently captures the horror and repercussions of slavery. The novel begins with the story of two half-sisters born in Ghana during the 1700's. Efia catches the eye of British governor James Collins who swiftly exchanges money with the family for her hand in marriage. He takes her to his castle where she lives a life of comfort and luxury. At this same time, Efia's half-sister Esi is imprisoned in the dungeon of that very castle. She lives in the inhumanely cramped and dirty quarters among hundreds of others from her village who are awaiting transport to the New World. Once there, they will be sold to live the remainder of their lives as slaves. Immediately the juxtaposition of the two sisters is established. As the novel progresses, chapters alternate between the two sister's offspring in a chilling and enlightening portrait of concurrent lives spanning all the way to present day. I was astounded by the depth and efficiency of Homegoing. The novel is only about 300 pages, but Gyasi manages to fill it with the emotional complexity and historical scope of a much larger work. Each chapter achieves the feat of introducing a new character who is instantly engaging. Mentions and appearances of previous characters help to put a focus on the large family tree that is established. Gyasi effortlessly adapts her style to adhere to each time period and character in a way that offers a fresh voice to the characters while still forming a cohesive whole. Simply put, this is a novel that you have to read for yourself. It defies an adequate description. Rather, you have to experience the work for yourself to truly grasp the brilliance that it contains. This entry was posted on Tuesday, May 30, 2017 and is filed under Book Review,Debut,Family,Fiction,Homegoing,Slavery,Yaa Gyasi. You can follow any responses to this entry through the RSS 2.0. You can leave a response. I have heard of this novel before and I know it is one which is well known for the way it discusses slavery and leaves a lingering impression with the reader long afterwards. From your review, it seems like it does just that. I do want to read this one someday myself as well. I think you'll really enjoy it.